The New Brunswick Loyalist Muster Rolls for the War of American Independence show that Jonas Carol (Carl) U.E. (c. 1761-1829) served with Col. Delancy�s Troops in 1777.1 Land records of 1789 of Nassau show he was a Lieutenant2 He also served in the Dutchess Co. Militia. Other records show that he was the son of James Carl, Loyalist, who received Crown Land in New Brunswick. Jonas settled in St. John New Brunswick. Jonas received Crown Land as a Loyalist from Fishkill Mountains, New York. Jonas received land grants at Parrtown, St. John Co., New Brunswick and on the Kennebecasis River, Kings Co., New Brunswick. In the second, undated and unsigned, he said "that he had joined the Royal Standard in the year 1777 at Morrisania, near New York, was an officer in the corps commanded by Colonel James Delancey. From there he went to Nova Scotia, and remained there two years, at which place his papers now are, owing to his intention to have returned there but having been taken up by the people of New York, put into a Dungeon and there close confined in circumstances your Petitioner has been obliged to remain here, otherwise should have returned and brought my Papers, some of which would shew that your Petitioner is not an imposter. Your Petitioner has had Two Hundred Acres of Land granted him by the late Land Board. He prayed that "such grant of land may be allowed him as is usual to people of his description." The Heir and Devisee Commission Reports, Series RG1, L5 gives us that information. "This is to certify that the bearer Jonas Carle has lived in this Province since the year 1789 and has a wife and five children and that his wife is the daughter of a Loyalist. Signed at Newark October 10, 1796. NB: The wife of Jonas Carle is the Daughter of Jeremiah Johnson killed by the Americans in the late War. Robert Kerr"
A second endorsement on October 15 recommended him for 200 acres in right of his wife, the Daughter of a Loyalist, as pr. Certified adduced, signed by Peter Russell. The Mini Atlas of Early Settlers� by Taylor and Parnall, p.26 Grimsby Township dated September 20, 1811 shows Jonas Carl�s wife as owner-Lot 6, Concession 7. Jonas received a Crown Grant of 100 acres for Lot 7, Concession 1, Willoughby Township, with the Broken Front on March 16, 1797. (Deed # C101, Welland Land Registry Office). Jonas Carl and Rachael had 7 known children: Elizabeth Ann (1793-1858); Peoebe, (1796-1871); Eunice, (c. 1802-1879); Sarah; Henry; John; Judith. After some years, in 1799, Jonas and Rachel with five children, moved by flat boats down the Ohio to the Mississippi river to Natches, then to New Madrid, Missouri for a couple of years. They then went to Baton Rouge, then Springfield, Louisianna, where both died, leaving many descendants. A memorial of bargain and sale from Francis Ellsworth (Butler�s Rangers) to James Smith; Lot 7 in first Concession below Black Creek is dated 15 Feb. 1796. Ulrich Strickler (1765-1838) was born in York County, Pennsylvania, son of Ulrich Strickler Sr.of Switzerland who had arrived in America in 1737. Ulrich Jr. and his wife, Magdalena Miller, had traveled by Conestoga wagon in the spring of 1801 from Pennsylvania to Upper Canada; having sold his land for $1700, Ulrich had sufficient funds to relocate to Canada (Robertson, 1996). He and his fellow German Mennonites were attracted to life under the Crown, which promised exemption from military service and an abundance of potential farmland. He purchased the 210 acre river front Willoughby property in June 1801. After 15 years, Ulrich was able to sell the property for the sum of 1000 pounds. It is assumed that he had built the stone house and had cleared and developed his lands. It is estimated that the date of the construction of the house would be between 1805 and 1810. In May 1816 Ulrich Strickler sold his property to Joseph Danner (instrument # 5156) and moved with his family to Clarence, New York. 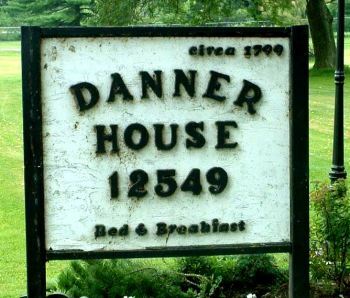 Joseph Danner (1774-1870) was a member of the Quakers or Society of Friends and had emigrated to Canada from Pennsylvania in 1807 as part of a westward Quaker movement between 1790 and 1820, which resulted in the establishment of Quaker settlements at Black Creek. He likely made a few renovations and additions to the house, including the narrow wing across the rear which housed a "loom room". In 1824 he also contributed towards the construction of a "school house and meeting house" on the River between Black Creek and Chippawa" (Sherk, 1905) which was built on the Gonder property. 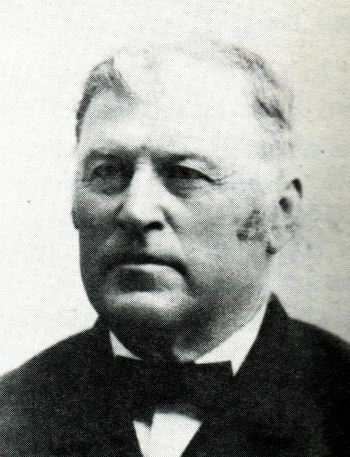 Elias Sherk (1825-1893) was the son of Benjamin Sherk (1796-1873) and Esther Hershey (1801-1879). He married Mary Zavitz (1826-1881), daughter of John Zavitz (1798-1872) and Nancy Harris (1803-1882) on March 23, 1847. The Sherks, originally spelled "Schoerg" or "Scherck", emigrated to Canada from Lancaster County, Pennsylvania. Michael, grandfather to Elias, settled near Point Abino around 1790, founding the village of Sherkston. Elias, and his wife Mary Zavitz, raised 13 children in the large stone house. Shortly after they moved in, Elias�s father in law, John Zavitz built a bake oven at the rear of the house under a willow tree. In 1858 Elias requested that the Township council open the side road between his and Michael Gonder�s properties. Sherk Road, as it became known, was built on a 66 foot strip of land from the north edge of the Gonder property. In return, Elias donated land in the southeast corner of his property to relocate the old Riverside Church. Elias was involved in dairy farming, using the milk produced in the successful cheese factory that he ran at the front of his farm from 1872-1886. Elias Sherk died in 1893. His son Franklin purchased the south half of Lot 7, Concession 1 and 2 for $3200. ((#2199) It was here that he and his wife, Alice Danner, raised four daughters. 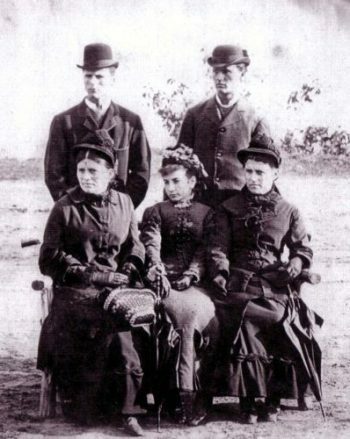 Franklin died in 1912 and his widow later sold the property to a Realty company in Niagara Falls. The Township of Willoughby eventually took over the southern half of Lot 7, Concession 1 and a number of the lots were sold by public auction. John MacTagart and his wife Mae (instrument # 80971A) purchased the house and attached lots in October 1961. MacTagagart obtained a franchise to operate Louis Tussaud�s Wax Museum in Ye Old Foxhead Hotel on Clifton Hill. He died in 1969 and Mae, his widow, continued to live in the house until her own passing in 1993. Their daughter Jane sold the property to Rolland Gregoire and Pierre Paquette in 1996. 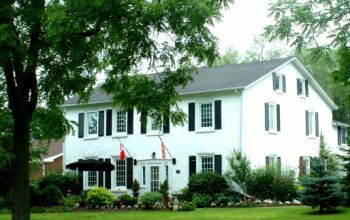 In 2000 the house received designation as an Historic House under Part 1V of the Ontario Heritage Act. It has become known as the Danner/Sherk House after two of the early families with long ties to the building. 1. Loyalist Migrations: New Brunswick to Upper Canada: Canadian Genealogist, June 1984, p.84. 2. Upper Canada Land Board, RG 1, L4, Vol.5, p.27. 4. History of Welland County, Ontario. (Belleveill, Ontario: Mika Silk Screening, 1972), p.43. 5. David E. Johnson and Roy A.C. Johnson, editors, The Johnson Reporter, Volume 11, No.3, Summer 1991. 6. Alexander Fraser, LLD, Nineteenth Report of the Department of Public Records and Archives of Ontario. (Toronto: The Legislative Assembly of Ontario, 1930), p.65.